It’s a challenge just to get finance for animation, particularly animation for adults, and it’s also difficult to get adult animation on television. Tea with the Dead (completed 2014) was funded by BAI, TG4 and the Irish Film Board. It was broadcast on TG4 (TV channel) in autumn 2015 and screened at film festivals all over the world, winning the Best Animation award at Rhode Island International Film Festival (Flickers) and Raindance Film Festival. Frank is a gentle, unassuming embalmer from a small town in Connemara. After Frank has completed the tasks of his trade – washed, disinfected, removed and replaced fluids, applied cosmetics and dressed the deceased – he always makes two cups of tea. One for him and one for the dead. The conversations Frank has with the deceased over those cups of tea are recordings of interviews with real Irish people, telling their stories. Wiggleywoo is Gilly (Creative Director) and Susan Broe (Producer) This award winning animation studio was established in March 2012. All our content is original and is created, designed and produced in-house, we have a slate of projects in development from preschool to adult animation. 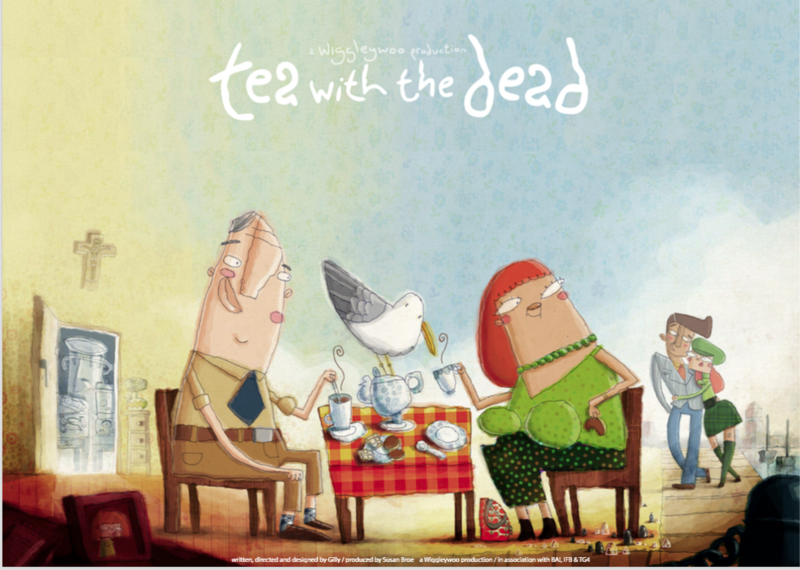 Our award winning adult animation series Tea with the Dead was completed in June 2014 and has won BEST ANIMATION at Raindance Film Festival and at Flickers Rhode Island. It was broadcast on TG4 on Christmas Eve 2015. In August 2015, we completed production on our preschool series The Day Henry Met which which has been pre-sold to RTE, Nick Jr, TVO Canada, YLE Finland, SVT Sweden. Series 2 of The Day Henry Met will be complete in Winter 2016. Wiggleywoo’s objective is to build a portfolio of Intellectual Property, made up of highly commercial animated television series which have the potential to work cross-platform and to generate licensing, merchandising and other ancillary income.